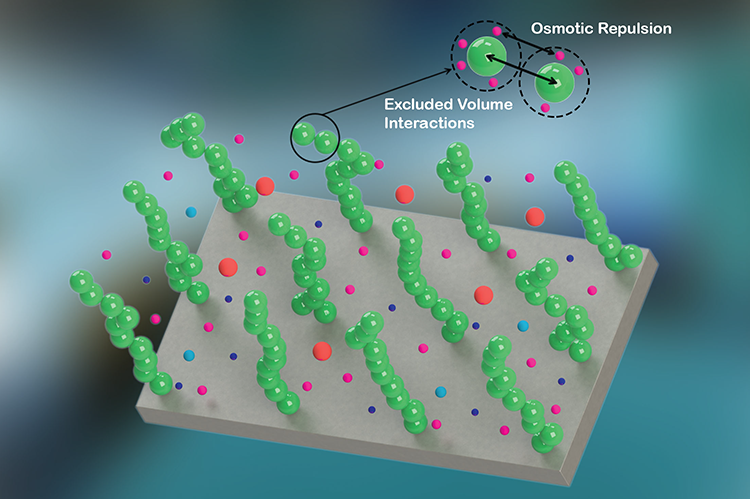 A new theory has been developed to account for the effects of excluded volume interactions and modified mass action law in the configuration and electrostatics of pH-responsive, strongly-stretched polyelectrolyte brushes. New research on the theory to describe polyelectrolyte (PE) brushes, led by Assistant Professor of Mechanical Engineering Siddhartha Das, has been featured on the back cover of the January 28 issue of Soft Matter. In the study, Das teamed up with Clark School graduate students Harnoor Singh Sachar and Vishal Sankar Sivasankar to provide the most complete strong stretching theory model to describe the thermodynamics of PE brushes. PEs are charge-containing polymers, which are large molecules composed of repeating chemical units known as monomers. The natural configuration of a polymer in a solvent that it prefers is coil-like. However, when the polymers are grafted at close proximity to each other on a solid surface, the polymers stretch away from the grafting surface in order to avoid each other and, in the process, eventually attain a brush-like configuration. Das and his students propose for the first time a strong stretching theory model of PE brushes that includes two effects that have been neglected in existing studies:  the effect of excluded volume interactions between the PE segments – these interactions originate because two parts of a given polymer or PE molecule cannot simultaneously occupy the same position, and  a modified mass action law that accounts for a wide range of values of PE chargeable sites – this law ensures that, unlike existing theories, Das's new model is capable of predicting the wide range of charging behaviors of PE brushes. “Functionalizing surfaces with charged, pH-responsive PE brushes are widely used for a large number of applications, such as fabricating nanofluidic diodes, nanofluidic ion sensors, and current rectifiers and nano-capacitors, as well as developing new strategies for targeted drug delivery, oil recovery, and water harvesting,” Das says. The paper based on the study, "Revisiting the strong stretching theory for pH-responsive polyelectrolyte brushes: effects of consideration of excluded volume interactions and an expanded form of the mass action law," is accessible online.